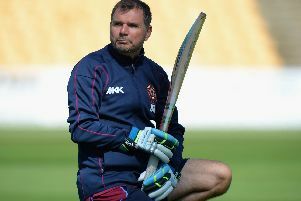 David Ripley admits Northants looked ‘rusty’ in their defeat to Durham Jets in the NatWest T20 Blast opener at the Riverside Ground. The Steelbacks slumped to 47 for five in reply to the home side’s 174 for eight before the rain ended the match, handing Durham a 41-run win via the D/L method. It was a disappointing start to the T20 campaign for the 2013 champions, who have high hopes, with the arrival of Shahid Afridi helping to bolster a talented squad. And Ripley gave an honest assessment of the below-par performance. “We’ve got to be disappointed, we’ve been well beaten,” said the head coach. “We looked rusty and we are a little under-prepared, but we won’t be the only team playing their first game saying that. “We played three four-day games on the trot and it’s very difficult to prepare for this game. “Callum MacLeod (who made 60) came hard at us from the second over onwards and we were a bit slow to respond. “We dropped catches and I’d put my mortgage on the guys who dropped them to take them. “We were just down and then we didn’t have a lot of luck with the drizzle getting on the wicket in the dark. “We were going to find it tough to mount an assault on a score we could have got because our last five overs of our bowing was certainly the best part of our evening.